Fast food hacks are essential for road warriors struggling to stay fit. Here’s the situation: You find yourself on a road trip without prepped food and in desperate need of some fuel. Skipping a meal is not an option. The only restaurants available to you are fast food chains. What do you do? 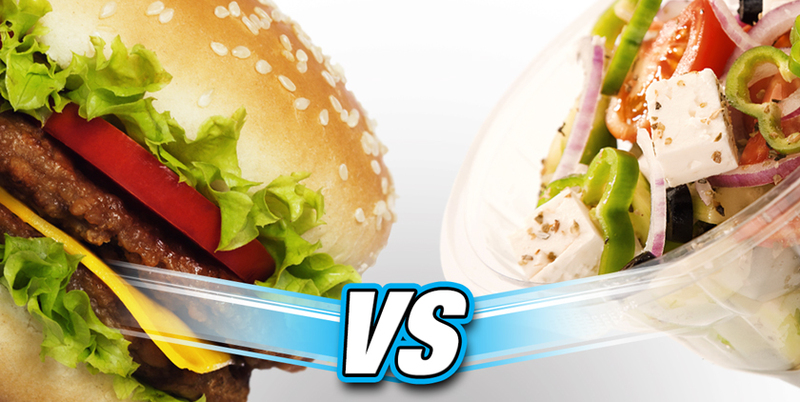 We’ve got your answers with these top five healthy fast food hacks. Skip the Caramel Macchiato and order up a turkey bacon breakfast sandwich. A low-carb English muffin with turkey bacon and eggs packs a lot of lean protein for an item with only 230 calories. Any time day or night, you can walk into a Denny’s to fuel up. It can be a great place to drop in if you know exactly what to order. The “Fit Slam” breakfast has the macros that make eating out not entirely out of the question. Switch to whole eggs (with the yolk) to get some added choline and skip the turkey bacon if you are watching your sodium. As far as fast food goes, Chipotle ranks pretty high for quality and grab-and-go convenience. This salad has protein and healthy fats with nutrients coming from vegetables and carbohydrates from beans. To get the most out of your macros, ask for a romaine lettuce base with extra vegetables. You can double your chicken for additional protein, too! At Subway, it’s all about the choices. Choose double meat, the 9-grain bread, load up your sub with veggies, choose mustard over mayo, skip the cheese — and don’t add a giant soda, bag of chips and a cookie. To eat healthy at this chain restaurant, it will come down to the selections you make that will make the difference in your macros. Our fast food order champ comes from Panera, which is on the fringe of being a true fast food establishment. Order up this arugula salad with chicken and ancient grains to get a whopping 32 grams of protein and just 400 calories. Sodium Phosphate – A general term used for a variety of salts, usually added to processed foods for flavor or as a preservative. Monosodium Glutamate – Sodium salt of glutamic acid that is a controversial additive to processed foods. DATEM (diacetyl tartaric acid ester of mono- and di-glycerides, also E472e) – An emulsifier primarily used to make strong gluten for dough. Carrageenan – Polysaccharide extracted from red seaweed. For help prepping your meals to avoid having to stop for fast food, check out our Top Meal Prepping Tips.